Are you one of those gardeners that check the ground obsessively for signs of life from the first mild day in February onward? Spring fever seems to affect gardeners more severely than others, and the remedy is to get more and earlier flowers in your landscape. Follow these tips to get more blooms out of our your garden than ever before. 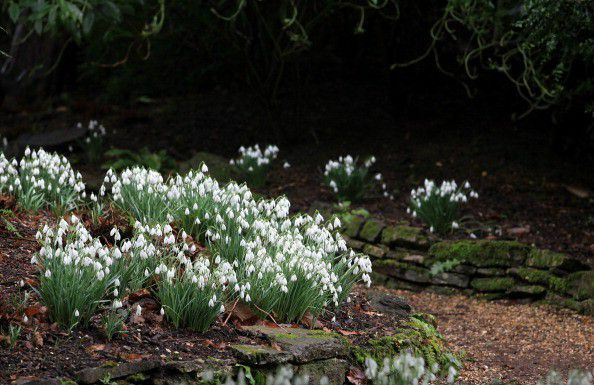 The colder the climate, the more anxious gardeners are for signs of spring in the landscape. Planting very early bloomers can make you feel like you’ve cheated part of winter, because these hardy bulbs may begin to bloom when the holiday decorations are just coming down. These petite flowers don’t make much of a statement when planted in groups of a dozen or less, but the low price of the so-called minor bulbs makes a planting of a hundred or more affordable. The common snowdrop, Galanthus nivalis, sports dainty white bell-shaped flowers on six-inch stalks. They bloom as early as January and naturalize easily in an undisturbed spot. If white flowers are lost in your snowy garden, consider the winter aconite, Eranthis hyemalis, which produce bright yellow flowers atop a ruffled collar of green foliage. Finally, glory-of-the-snow, Chionodoxa luciliae, produces masses of blue, pink, or white star-shaped flowers to satisfy your pastel flower cravings. If your digging arm ran out of steam after planting the first bag of fifty tulips last fall, your spring flower show may not be as lush as you wanted it to be. Interplant your large bulbs, like tulips, daffodils, and hyacinths, with cold-hardy annuals. The resulting look will resemble a gardening magazine spread or public garden display you have admired. When creating a flowering landscape, follow the garden design principle of starting with trees, then shrubs, then plants. Shrubs not only give the garden texture and dimension, many offer reliable spring flowers for sunny or shady situations. Azaleas herald the arrival of spring in many southern gardens, and forsythia does the same in temperate climates. If the thought of a plain green shrub amidst your flowers doesn’t thrill you, choose a shrub that displays bright berries after its flowers fall, like viburnum. You can also look for newer cultivars of old favorites that have variegated foliage, like daphne ‘Marginata’ in warm climates or elderberry 'Madonna’ in cold climates. When you include flowering containers in your spring garden, you can get earlier blooms in your garden than when you plant in the ground. You can bring small hanging baskets into a shed or garage when temperatures plummet at night, and even large containers can move to a sheltered area if you employ planters on casters. Some of the most beloved container plants thrive in cool spring temperatures, including snapdragons, petunias, and annual lobelia. These cool-season annuals are at their flowering peak when daytime temperatures are in the 70s. Other container flowers, like viola and nasturtium, can tolerate early spring frosts. Planting bulbs under a lawn doesn’t take any special skill; the most important care tip for naturalizing flower bulbs in a lawn is to delay mowing until the bulb foliage matures. Therefore, choose the earliest blooming bulbs to plant, unless you don’t mind letting your grass grow as long as strappy bulb foliage. 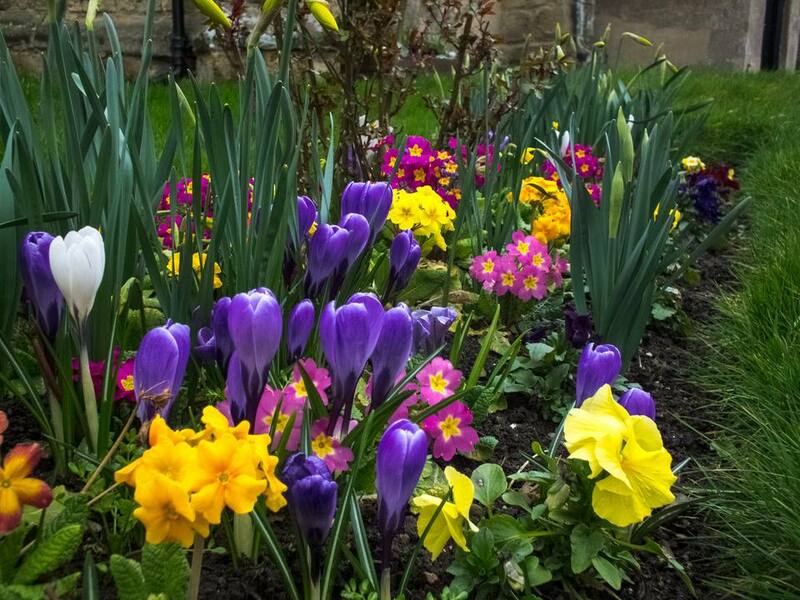 Crocus bulbs are the most commonly grown flowers in a lawn, but you can also try snowdrops or iris reticulata. Slice your sod with a sharp spade, and plant groups of bulbs at least three inches below the soil surface. If flower gardening is a visual hobby, no one gets excited about the sight of a bag of gnarled roots at the garden center. However, there are benefits to buying and planting bare root flowers at the beginning of the gardening season. Imagine digging up your favorite day lily on March 1st. What would it look like? It would look like one of the root balls in those bags, perhaps with a tentative stem beginning to emerge. In this semi-dormant form, plants are less likely to incur damage from late spring frosts than those plants that have fully developed foliage. In fact, by the middle of summer, bare root perennials may be indistinguishable from potted plants that were installed in the early spring. As a bonus, bare root perennials are much cheaper than potted plants.